We will have live coverage at the club of the Carlsen-Karjakin world championship on Saturday November 12 (round 2) and Saturday November 26 (round 11). Casual chess will be available as usual. The games start at 12:30 Winnipeg time. If there is interest we will keep the coverage going past 4pm on the 2nd floor common area of 91 Albert . On Saturday November 26 the club will be meeting in the room at the back of the third floor instead of the usual room at the front of the third floor. The world champions will take a break on Saturday November 19 (between rounds 6 and 7). We break for no-one! Our regular, casual club day is still on. The chess club is a voluntary, non-profit association. We’re not incorporated and we don’t formalized membership or a board of directors. The most formal thing we’ve ever done is open a bank account. Where we direct our time is opening/closing our club week in and week out and occasionally running special events like tournaments. The people who do this consistently are an organizing committee. We’ve now taken the step of calling ourselves that and have made it clear that participation in making this happen is open to new people who demonstrate responsibility and commitment. We’d like more help and would like to rely on a broader base of people to take care of this over time. We invite folks interested in helping to come out to our September 10 club day, where as an organizing committee we will renew our opening/closing commitments for the next quarter and consider interest from new organizers. Mind Sport Manitoba is hosting a sectioned, 5 round-robin rapid tournament (plus a group champion bonus round) on Saturday July 9, 2016, 9am to 7pm at Sinclair Park Community Centre. Entry fee is $20. We will still be hosting a casual club day at 91 Albert St, noon-4pm as ussual. Choose your own adventure. We are now wrapping up our second year of hosting casual chess every Saturday noon to 4pm. I am proud that we have demonstrated the viability of a drop in chess club located downtown that makes rent by donation vs charging for memberships and is open every single week. Attendance and donations have been very strong in the last three months in particular and we’re impressed by the scholastic and CFC tournament performance of club attendees. As we start year three, we have decided it is time to open up our organizing committee to more people. Jamie and I (Mark) have been opening and closing every week and also receiving a lot of assistance from folks in attendance, Theo in particular. To make the club stronger, lighten the load on Jamie and I, and to ensure we continue to never miss a week we are expanding the organizing committee to include more responsible folks who love enabling casual chess. To join our all-volunteer organizing committee, we require that you sign up in the next three months (May-July 2016) for a commitment to do three open/close shifts for casual days or organize one special event like a tournament, simul, or other chess related event like a workshop if they are designed to create high attendance and revenue. Checking our venue’s calendar to open the correct room. (we can be booked in any one of three rooms at 91 Albert) We will provide access to the keys. Showing up on time for opening at noon. Moving tables, chairs, equipment and cash box into position for club use, often requiring effort up and down stairs. Greeting newcomers, offering them extra attention in getting the opportunity to learn and play. Letting attendees know that voluntary donations allow the club to make rent and run casual chess week in and week out and showing appreciation for said donations. Room cleanup up to the standards of our venue, and commencing this cleanup in time to be out of the room by 4pm if there is another booking right after us. We will train you in all of these things and be available to support you carrying out this work. Ensuring the largest room of our venue is booked specifically well in advance so we have room for a special event to hold a crowd. As a member of the organizing committee we will include you in the internal discussion process whenever the club has bigger decisions to make. We will be wrapping up our organizer calendar for May-July at the April 30th club day, so if you would like to volunteer to open/close and be part of the organizing committee in that period, please let us know in advance of or at club that day. If you’re not able to attend, please let us know by email which days you would like to commit to. Auxilary volunteer assistance to help us with the above workload is also welcome at any time. If you’d like to volunteer for us in the May-July period, but can’t commit to three shifts or a special event, let us know. At this time we also welcome offers to help us organize in the August-October, 2016 quarter. Simultaneous chess exhibition with National Candidate Master Isaac Wiebe. Doors at noon, simul starts at 12:30. Discounted admission to $10 for players registered in the Canadian Chess Challenge (Scholastic Chess Association of Manitoba). Isaac is the 3rd highest active rated player in Manitoba and the only one in the top 3 without a master title. 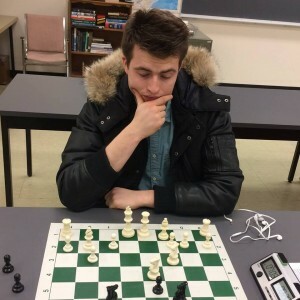 He’s climbed from a 1654 to 2245 Chess Federation of Canada rating in only 16 months. As the Manitoban most likely to become our next master, we’re giving you a chance to slow his ascent! Isaac has agreed to pass on the usual convention of playing white on all boards to play alternating white and blacks. A five round rapid swiss tournament with half of entry fees ($15) supporting the club and the other half forming the prize fund. Where: 3rd floor, 91 Albert St.
Time: Registration closes at 1pm, pairings announced shortly after. Doors open at noon for setup, registration and casual play. Parking: See this parking guide . The two hour street meters (first two hours free) are not advised as we’ll have tight starts between rounds. Save the hassle and park in a lot. Cell phone ban. First instance, game in progress or next round is forfeited, next instance, out of tournament. We welcome players in the vicinity of a cell phone going off to pause their clock and to help point the arbiter in the direction of the infraction. Regarding 50 move (since pawn move or any capture) and 3 move repetition draws: games are not required to be recorded as per FIDE laws of chess Appendix A.4.b and we don’t recommend doing so. As such, we don’t expect that anyone is going to claim these kinds of draws by writing the relevant move down down prior to making the claim as per FIDE laws of chess 9.2.a and 9.3a. But, it is permissible to pause the clock and attempt a draw claim on your own turn as per FIDE laws of chess 9.2b and 9.3b if you believe your opponents previous move was the 50th move or later or has created the third or later repetition for a position. Because there is no writing of the moves by the players and no assistant arbiter or fancy e-board recording the games to help us evaluate such claims, we will resolve them as follows. i) if your opponent agrees with the draw claim, the matter is so resolved, if not ii) an arbiter or a designated assistant watching the game can deem the claim valid or invalid by their own observation, claims that are denied by not in the opinion of the arbiter made in bad faith will not be penalized, or iii) if the arbiter or designated assistant is not watching the game, the arbiter should be notified that a draw claim was made but not agreed up, and play will continue with an arbiter or assistant to continue watching it there after. The arbiter and assistant’s will also endeavor to declare games drawn as per FIDE laws of chess 9.6 if by their own observations there have been 75 or more moves without a pawn move or capture or 5 or more repetitions of position. Half of entries will go to prizes. Prize fund will be divided into a overall leaders pool and under prize pool if at least 5 under 1600 CFC and/or CFC unrated players are registered. Otherwise, the entire prize fund will be for overall leaders. The under prize pool will be for lowest ranked 1/3 of field, at our discretion we made move the cut-off line a few places to reflect rating clusters. Under prize elligibility for players without CFC ratings but with ratings from other over the board settings will be determined by the tournament directory. The next $30 will be allocated 50% to 1st, 25% to 2nd, 25% to 3rd. There will be no chess club at 91 Albert on Saturday October 31. Instead we will be hosting a tournament at the The Neon Factory, at 594 Main Street. This tournament will be a FUN rapid tournament. The plan is to have 5 rounds with a time control of 25 minutes. The entry fee will be $5.00! All of the money raised from the entry fee will make up 100% of the prizes. Lunch will be included! The Millionaire Open starts today. One very cool feature of this tournament is that they use DGT boards to broadcast the moves from the top board of each under section. I’m going to grab some of the under 1600 games that will be played and make analyzing them my theme of the day this Saturday (October 10). I’ll also have a laptop out so we can watch some of the games in progress. Also of note, Winnipeg’s own John Remillard is playing in the under 1800 section, if he’s fortunate enough to find himself on top board, we’ll definitely be looking at that. At 3pm I’m going to put on the video broadcast of the tournament. The CFC has a formal system for being recognized as a class player or title holder that includes being able to achieve classes and titles with three performances norms and a base rating. These make for interesting incremental goals and opportunities to recognize good performances. As Silman says, you can’t just shoot for master, it’s good to set goals for levels in between. Will Bonness scored his 2nd class B norm and 3rd and final class C norm. Congratulations Will, you are now officially a class C player. Even without norms he is very close to have a rating over 1700 (other path to class B) once he reaches 24 games. I’ll be coming back and seeking my first class C norm in the November/December TNT — in a previous post I claimed to have already done this, but the relevant tournaments didn’t include the required 5 games which is part of the rules for CFC title/class norms. Prizes: 75% of prize fund will go towards overall prizes, 25% will be used as under prizes for the bottom 1/3 of the field, unless there are few low rated players, in which case adjustments will be made. Other rules to be announced.